When it comes to commercial rooftops, the professional’s choice in a variety of industries of building development, management, maintenance and architects is the Pipe Prop rooftop pipe support system. One of the primary reasons is the overall strength to carry heavy loads while being able to withstand a variety of harsh weather conditions in different climates with the United States. In it’s strength testing, Pipe Prop cut to 3.5” height, provides a load bearing capacity of 8,192 pounds at 0°F to 5,035 pounds at 140°F. And while it’s strength is easy to see, what makes it a favorite of a variety of electricians, contractors, plumbers, architects and HVAC professionals is it’s light weight and easy-to-install system. Weighing in at only .05 lbs. per unit, it is lightweight and easy to carry to the rooftop, attics up and down ladders. Pipe Prop is also made of a tough, durable ASA plastic,formerly known as Acrylonitrile Styrene Acrylate , which has a high grade of toughness and rigidity, includes a chemical resistance and thermal stability as well as a high resistance to weather-related aging and yellowing. And not that, the Pipe Prop plastic is heat resistant and UV ray resistant making it one of the most durable plastics available. Even after 10 years of usage, Pipe Prop has exhibited a zero loss of structural integrity or capability. 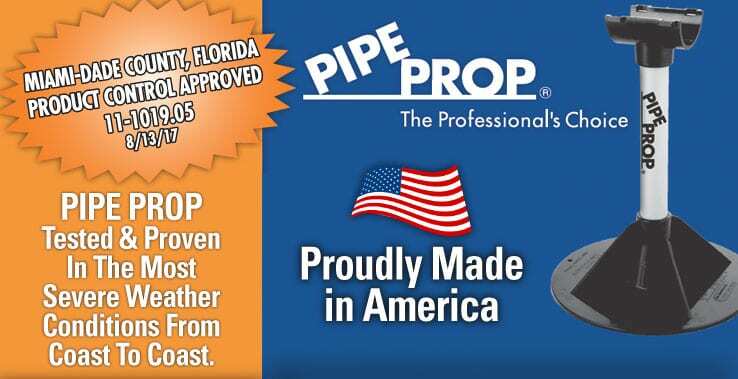 The Pipe Prop rooftop pipe support system comes in flexible sizing and pipe size requirements and is Miami-Dade approved for Dade County, FL with the Department of Permitting, Environment, and Regulatory Affairs (PERA). They trust the Pipe Prop to carry heavy loads while still withstanding the some of the most severe and destructive weather conditions from Florida to California. The Pipe Prop adjustable pipe support system has been proven and tested from coast-to-coast.